I love Taipei. It is so chill. It has a city feel, but also seems more rural and friendly. I went for three days last week over the Dragon Boat festival holiday. (I missed the festival in HK, but it was great to get away for a second. I’ll go next year?) It is like Hong Kong in a lot of ways, but more relaxed, more space, friendlier people. I would say visiting Taipei isn’t all about the doing things, and it is more about the relaxing and the drinking tea. I drank a lot of tea. I drank 4 hours of tea in 3 days. I also went to the zoo, rode many hours on the MRT with my 3 day unlimited pass, saw some monuments, ate dimsum, and tons of street food. It rained every day we were there. The first day it started when we were in Shilin night market. We just sat down to eat some street noodles when it started. 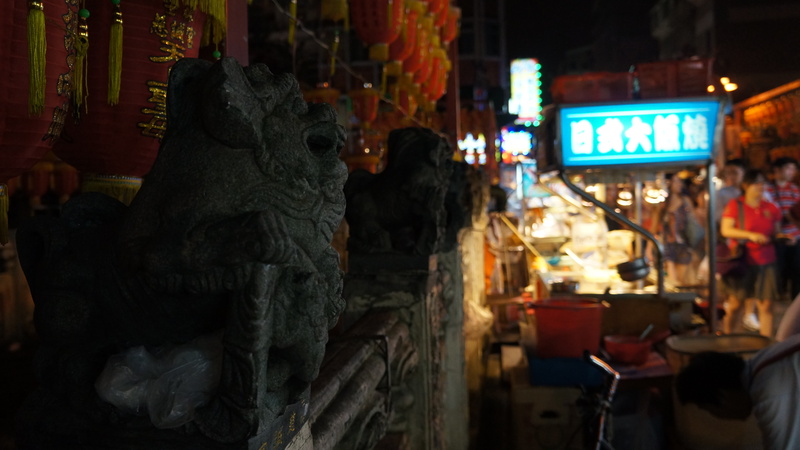 The woman’s stall was in front of a local temple, lit with a flashing sign and rows of red lanterns. Her soup looked like slime–noodles and chunks of seafood contained in gel–but tasted amazing. Delicious, savory, soothing. As it began to pour her partner grabbed an umbrella from behind the temple wall and erected it over the table. We proceeded to eat more: liang mian and barbeque meats. Also we shopped: jewelry and sunglasses mostly, because all the shoes were too small (I eventually found some that fit perfectly and wore them the rest of the weekend). The next day we went to the zoo. Taipei zoo is fantastic, apparently the biggest in Asia. There seemed to be fewer tourists because of the moderate rainfall, which later turned into a thunderstorm. 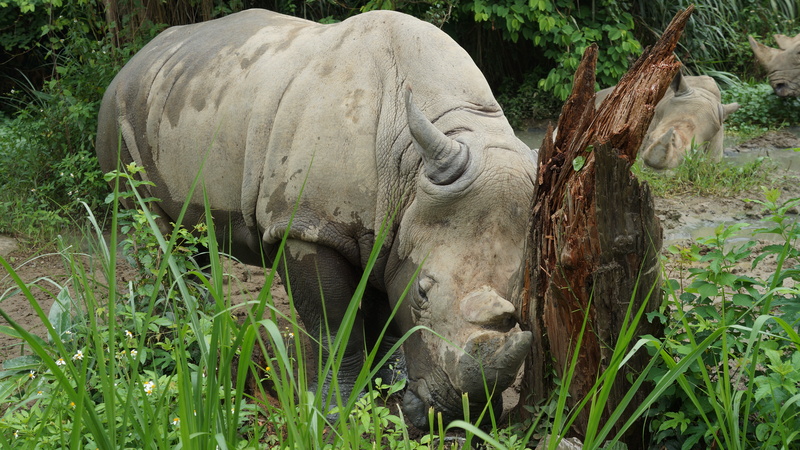 We think this made the animals more active, and also made them hide under shelters–palm trees, overhangs, or the hippos who just went into the water pits. I loved the zoo, truly incredible. I especially loved the hippos, this is partially because my dad likes hippos, or at least would talk about them all the time when I was a kid. I took a bunch of pictures of hippo eyes poking out of the water just cause I thought it was so cool. Other highlights: a gorilla stared into EJ’s eyes for a full minute, a bengal tiger took a dump, a rhino scratched himself on a tree about 2 meters from us, koalas munched on leaves, and a panda looked exasperated with his life. While the storm handily cleared the park of all crowds for us, it also made the gondola up the mountain shut down. Instead we took a bus up the winding roads on the mountain side to Maokong. From there, in the pouring rain, we stumbled into the nearest teahouse, which happened to be fabulous. We sat on cushions, ordered some tea, and started taking some pictures. The tea came: a clay tea pot, hot water, tea leaves, cups, a series of wooden utensils, and a draining bowl. We didn’t really know what to do. EJ was brave and communicated in our broken Mandarin that we needed help. A woman came over and demonstrated the series of pouring required to brew the perfect cup and we proceeded to sit, watching the rain, pouring tea, for 2 hours. The next day we went to another teahouse after Wistaria Teahouse, one of the first historical sites in Taiwan. We poured and drank tea for a few hours, listening to the rain hit the windows. Longshan temple was stunning: pouring rain, people praying, incense burning. Rain dripped off the eaves, poured over the tables of offerings, mingling with the incense smoke. It was stunning. There was tons to do, but I felt no pressure to do it all. There were beautiful things to see, and it was relaxing to see them. The food was delightful, and the tea soothing. It was just relaxing. A lovely city, easy to get around, easy to have fun. It was beautiful in the rain. I felt refreshed.